Click (do not drag) the squares next to the blank square to slide the pieces until yours matches the project photo below. Solve it in less than 500 moves and win a prize! Congratulations, you solved it in less than 500 moves! You are eligible for a prize from Portland Bolt's stash of cool gear. One prize per person per puzzle. We reserve the right to change the prize policy without warning. Prizes will be awarded for finishing the puzzle in fewer than 500 moves. 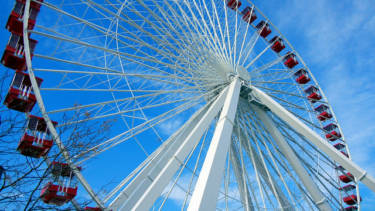 This 15 story Ferris wheel was a main attraction at Chicago’s Navy Pier, where it had resided for over two decades. This Ferris wheel helped make the Chicago Navy Pier a top tourist attraction and is expected to do the same for the city of Branson. The Ferris wheel was modeled after the first Ferris wheel built for the 1893 Chicago World’s Columbian Exposition. This Ferris wheel stands 150 feet tall and has 40 gondolas, which can hold up to 240 passengers.